I drove out to the American Bottom floodplain on Saturday. On a hazy, moderately warm afternoon that was just cool enough to keep a sleepy ambiance at bay. I hadn’t been on this particular stretch for a long time. Well over two years. It’s the broad, open area of farmland that lies on the Illinois side of the Mississippi River to the south of the Jefferson Barracks Bridge. Several years ago I spent a lot of time exploring this region and had become familiar with the many roads criss-crossing the fields, and as I drove I began to recall familiar sights and scenes. A lot has happened to my photography in the intervening time. I’ve joined photography clubs, taken up film and medium format photography and expanded my range considerably. Yesterday, I had my Canon 5D Mark III, yes, but also my Rolleiflex plus three Canon film bodies, a 650, 620 and Elan 7E. For the first time I was going to photograph this area on film, black and white and color. Much of the Mississippi Valley above and below St. Louis has been photographed by Quinta Scott. Including the American Bottom floodplain. She has a fine book of photographs called “The Mississippi: A Visual Biography”. I borrowed the book from the library some years ago and learned a lot, but recall being underwhelmed by the subtle tones of the photography. This was the time when I was most heavily invested in the digital look and had lost an appreciation for the appearance of film. That has been regained. Regained so much that a lot of digital photography simply looks garish and unnatural to my eyes these day. Despite the obsessive trend towards ever sharper sharpness and finer and finer pixel resolutions. Maybe because of these trends, even. Yesterday my goal was to find an attractive scene and to photograph it in a number of different ways. Color digital, color film, black and white film using a number of differently colored filters. These days my black and white filter collection covers yellow-green (Hoya X0), yellow (Hoya K2), orange (Hoya G) and red (Hoya 25A). 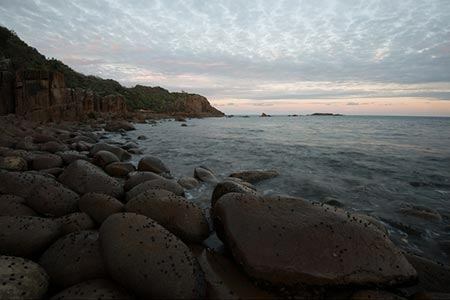 You can emulate any of these filters with a digital image and Lightroom or Photoshop, and very easily too, but the look is not the same as that obtained with black and white film. Whether the difference is worth the effort of shooting film really depends on your philosophy of photography. In my case it is. The image above, retaining a good degree of the haze of that afternoon, was shot using a yellow-green filter. A blue filter would have accented the haze even more. I’ll have the results from the other filters when I get around to developing those films, but for reference here’s the digital image photographed using a polarizing filter. It’s a slow day at work and I’ve been drifting through the photography websites, once again marveling at the ubiquity of style found in popular photography. It’s so hard to stand out as original. Paradoxically, many of the most technically accomplished photographs suffer even more since they often emulate a look that has become familiar through over-promotion of similar appearing photographs. I’ve noted this before in similar posts on this site and so there’s no surprise here. But it got me thinking about my own photography in a different way from before. Most often the beginning photographer, to a large extent unaware of any technical or aesthetic rules, takes pictures of things that are meaningful at the time. Family, friends, places visited, vacations and celebrations. The resulting pictures are resonant with the photographer but are frequently not in the least bit interesting to an emotionally detached observer. Hence the stifled yawns at the projected slide shows of old or the smart phone photo collections of new. The photographer, as he or she journeys into the art, begins to pick up rules and tips. All designed to lift the photograph away from the personal and into a more universal set of expectations. It’s this process that teaches the photographer technique and control of the camera and the judgement required to produce such appealing work. So you get there. You can produce brightly vibrant, silky toned, entrancingly sharp, meltingly blurred, rule-of-thirds compliant mini-masterpieces. And you look at them and say – this means nothing. Not nothing if you are seeking to sell these images or your skills as a photographer. They are the line and hook that draws custom. They also draw appreciation from the many others who too have reached or are close to reaching this level of accomplishment, acquiring likes or competition wins. All meaningful in their own way, but just how meaningful is that way? For some, a great deal I suspect. And why not? But, me, no – there’s something lacking and, again, it relates to that lack of personality. As in personal personality. That’s the nothing. So I’m going backwards. I’m taking pictures of places, people and things that resonate with me. Places I visit often. Places I find contemplative or stimulating, often over and over again. Thus over the past year I’ve been collecting a lot of pictures of the same thing. The art of the picture, if art it is, is in reconstructing the dominant emotion I felt at the time. That can vary considerably and is a product of both my internal mood and the world I observe. It’s meant moving away from certain styles and techniques that leave me cold. My embrace of film is partly because I find the texture of film photography to be more organic and emotionally resonant than the results obtained by digital means. Partly this is tactile. Simply handling film imparts a sense of artifact that is lacking in digital up until the relatively rare stage of making a print. But even then, comparing prints from digital to prints from film, there is a strangely alluring almost-mystical quality about the film print that is not present in the digital image. For me, anyway. Some of this is historic. I grew up with film. All of the most emotional moving pictorial records of my youth are on film. So there’s an inbuilt bias right from the beginning. I spent a lot of time denying or belittling this bias during the years I threw myself wholeheartedly into the world of digital photography. I should not have. I allowed myself to be seduced by the new technology and bought into the prevailing wisdom that film was dead. A medium for has-beens. Let’s say that today I am happy to be a has-been. Most of my posts here are concerned with my artistic development – or lack of the same – and my love/hate relationship with the world of photography. I write them as a form of therapy and clarification. Every once in a while though, I find myself focused onto something else. In this case, a piece of camera equipment. The Canon EOS 650. The 650. Not the 650D. This is a film camera. The first, the very first, to use the EF mount and the EOS designation. Launched in 1987 and ‘an interesting historical piece‘ as noted by PhotoNotes.org which then goes on to dismiss it in terms of functionality to later EOS cameras. True. Examine its specifications and they seem almost charmingly limited in terms of what had come since. A single focus point. A maximum shutter speed of 1/2000. No exposure bracketing. No E-TTL or, indeed, a built-in flash. Next to no controls, dials and buttons. No wired or wireless remote. No viewfinder exposure +/- scale. No adjustable diopter. Yet despite all this, I really enjoy using this camera. The lack of features turns out to be freeing rather than restricting. It’s the very rare circumstance where I regret not having a particular option and even then most limitations can be worked around. Instead, I find the absence of clutter refreshing. It’s a layer of complexity and concern removed. Unlike today’s digital cameras, stuffed with menus and fancy features, where it’s so easy to get caught up in fretting about whether to use this or that when all the while all you really want to do is get the shot. Using the EOS 650 is as close the zen-like experience I get from my Rolleiflex as I’m going to find in the Canon EOS series. There are a few even simpler EOS cameras out there – the 850 for example – but the lack of manual control in these SLRs puts them closer to point-and-shoot cameras than anything really useful. The 650 on the other hand always seems serious. So I am often found carrying the EOS 650 with an EF lens of much more recent provenance such as the ubiquitous 24-105mm f/4L or the tiny 40mm f/2.8 STM pancake lens. All working together in perfect harmony and giving me precisely the right sort of photographic pleasure. Pete Shelley’s writing often contains little pearls of wisdom, and never more so than during the “A Different Kind Of Tension” period. Song after song dealt with the irony of life and its contradictions, but always with a underlying philosophy of finding your own way. 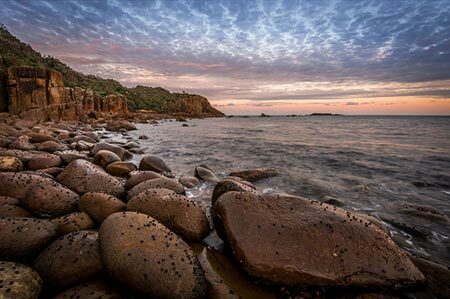 For a couple of weeks, I dallied with an online photography competition site called Gurushots – I think PetaPixel turned me onto it – before exiting with a faint sense of disgust. Apart from it being yet another very obvious attempt to lure the amateur photographer into the Photoindustrialart Complex, it reeked of conformity with many other popular photography sites that peddle a certain flashy but sterile form of photography. Another escape. Yet not so long ago I was striving for much the same type of image. Colorful, sharp, attractive in content, digitally pristine, safe. And I found I could do them. It takes practice and skill, there is no denying that. But the achievement was unsatisfying. I felt that all I was doing was emulating a trend or fashion. The art proved to be profoundly impersonal. Moreover, I began to realise that this art – the art of popular photography – was generating precisely the same negative emotions that I gained from a certain form of music, the flashy kind, technically perfect but soulless and unchallenging. Where was the equivalent of The Velvet Underground, The Buzzcocks or Arnold Schoenberg in this popular milieu? There isn’t one. Most popular photography is the equivalent of soft rock and jazz, guitar gods, the more sterile forms of progressive rock, easy listening classical. One only has to look at album art to see the match. “Where in the world are we? Why am I wasting my time? I sometimes think the best solution would be to tear myself aware from photo sites and photo clubs. But that would eliminate a social aspect from my photography, and I’m not sure I want to. What I do want to do is feel freer about doing it on my own terms. So let’s let that be, shall we? (My message to myself, this is.) No more seeking strokes, likes or acclaim and no more caring about the lack of or surfeit of the same. Just take the pictures. I know what I like. I watched three Antonioni movies last weekend. “L’Avventura”, “Red Desert” and “Identification of a Woman”. I’ve already touched on “Red Desert” below, and described some of the qualities that Antonioni brings to his films. Qualities that I find spellbinding as a still photographer. Although there are many outstanding movie makers, and many outstanding films, Antonioni’s work strikes me as the most purely photographic of all. Partly this is due to his predilection for long and relatively unchanging takes that force the eye to take in the scene and contemplate it much as one does a still photograph. Whatever action there is is often subtle and designed to complement the background scene, either in harmony or disharmony. The effect is always multi-leveled, one reason why Antonioni’s films can be watched over and over again and new insights gathered with every viewing. 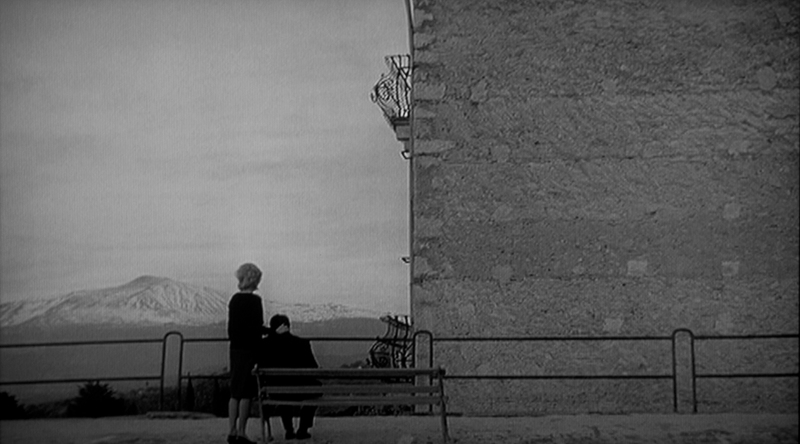 One of Antonioni’s finest images is the final frame of “L’Avventura”. A couple is attempting to overcome sexual betrayal, yet at no point during the lengthy interaction of the two in the preceding scenes has there really been any concrete bonding between the man and woman. Every interaction has spoken of doubt and uncertainty. So the moment of tenderness shown here, as the woman touches the man, is striking in its sincerity and genuineness. The movie ends with this moment, and the glory of this final scene lies in the vertical split between two views, a long shot of a far mountain and a bare stone wall. The long shot speaks to openness and possibility, the wall to an abrupt and final end. Each component makes up 50% of the scene, hovering like a tossed coin, with the outcome left open. This is a masterpiece of photography. An image that, hung as a still, I could gaze at for hours. Is it any wonder that I, moved so strongly by an image such as this, find the vast majority of today’s popular photography absolutely vapid? Can you relate to this? You created what you thought was going to be the world’s greatest, most stupendous, most wow inspiring landscape photograph ever- only to be disappointed when you opened it up in Lightroom… Maybe, it looked something like this? Not at all what you saw that morning… after you got up early… and hiked all that way. Flat! Dull. Lifeless. And just plain blah! But all is not lost. Because with a little bit of knowledge… Your image could be transformed into a calendar-worthy photograph of the highest caliber! Now, I am not going to argue that the transformation here fails to change the photograph into one that is more calendar-worthy. Indeed it does. My argument is much more broad than that. It is that photographs that are ‘calendar worthy’ are intrinsically uninteresting in their own right. I know this attitude puts me at odds with most photographers, many of whom – with greater or lesser success – are striving precisely for this look. It’s part of what is often characterized as an appearance that ‘pops’. A look designed to instantly attract and to hold the attention of as many people as possible. Maybe is my mildly misanthropic tendencies that alienate me from this trend. Perhaps it’s wandering through art museums and finding greater pleasure in the deliberately understated art of photographers of the Dusseldorf school. Mostly, I think, it’s the absence, to my mind, of any story or philosophy behind such work that leaves me regarding them is such a cold light. This was brought home most forcefully to me today while watching Michelangelo Antonioni’s “Red Desert”. His first color film and one photographed in a deliberately painterly way. Deliberate in that Antonioni frequently paints his subjects and backdrops to reflect a coloristic way of regarding the world that is based more on psychology than realism. And very much more on an underlying philosophy of existentialism. It’s a remarkable film that in almost every frame reveals an artistry that reveals the vast majority of popular contemporary photography to be conformist, vapid, materialist, emotionally empty and crudely manipulative. Watching it, I marvel at Antonioni’s vision. As exemplified by this screen grab below. 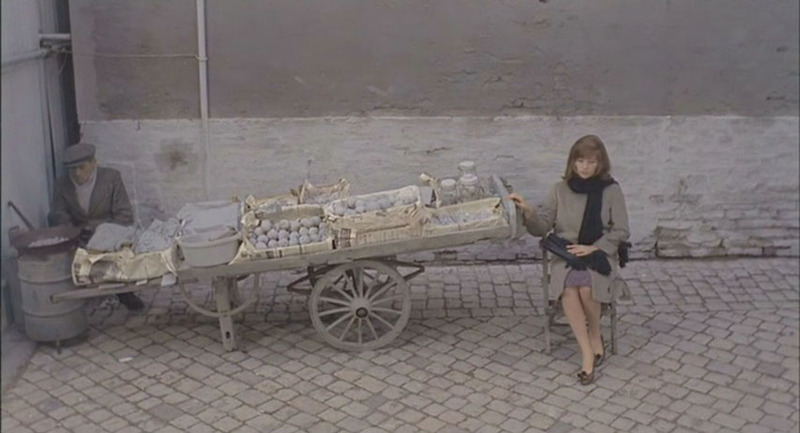 The protagonist played by Monica Vitti stops to rest by a street vendor selling fruit and vegetables. Only all color except pastel grays and yellows has been removed from the shot. In this case, all the produce has been painted gray. Colors that match both the street and the clothing worn by Vitti. It’s a remarkable shot, just a very brief interlude in the film, that reinforces the pale emptiness that threatens to overtake Vitti’s character. An emptiness that acts as the central theme to the movie. Undoubtedly I am helped in my appreciation of Antonioni’s work by an underlying sympathy with his worldview, but even if I wasn’t, it’s impossible to argue with the overwhelming photographic artistry on display throughout “Red Desert”. In my case, I have to go further. Because I regard work such as this as paramount, I am inevitably compelled to dismiss the manifestations found so often in popular photography. It’s a rather lonely and isolating path to follow, but for me it’s real. That’s where I prefer to be. It’s been a long, slow, winter. Not unduly frigid or particularly snow stormy, but just long and teasing, with enough warm days to suggest a lifting of the cold only to see it slam back again the following day. Enough to say enough is enough. Within two days of beginning this post, the weather turned. The sun shone and the temperature rose well above freezing. Practically into the warm. Last month (February) I took 34 digital photographs and 195 film photographs. Even allowing for the enthusiasm I expressed when I first went back to film, this is a remarkable development. Not one I would have predicted to be honest. I really did think this was going to be a fad for all my fine words at the beginning. After the thrill had worn off, surely I would return to ease and simplicity of digital photography. Well, it hasn’t happened yet. There are lots of reasons why. Perhaps the most surprising is the growing and deeply satisfying sense that by returning to an obsolete technology I have stepped off the bandwagon of endless upgrades. With the concurrent abandonment of the deep covetousness that often overtook me as I perused the camera equipment websites. This has been an enormous relief. I really was unaware how much time and effort I had been giving to tracking the latest trends and technologies. Often paying a lot of money for a beautiful but ultimately only marginal upgrade in equipment. I’m actually spending less on my photography now than I have for years, despite buying film and developing materials, simply because I am no longer chasing that $2000 lens or body. Instead I am using equipment that is decades old. Even when using my old Canon film bodies that can support a large subset of my accumulated lens collection, I find myself falling back to very few lenses, most often my by-now quite old EF 24-105mm f4/L. With the Rolleiflex, I am restricted to the Schneider Xenotar 75mm lens built into the camera, but it doesn’t feel like a restriction. For the first time ever, I am beginning to understand why some photographers never felt the need to move beyond a single fixed lens. Moreover, for perhaps the first time since I began photography as a child and really didn’t care what I was using (or indeed that much about the resulting picture), I find myself thinking of the photograph first and the equipment second. This has to be a good thing. I find myself taking far fewer photographs overall, but with a much higher satisfaction quotient from the results. Photography has not only become more fun; it has also become more rewarding. I have also learned a massive amount about film over the past months and find this knowledge bracing. I’m slowly tiptoeing into color, and will get more deeply involved with time. Whether black or white or color, I find the look of film entrancing. Yes, I could photograph digitally and process the image to mimic film. The technology to do this improves all the time. But that would remove the process element from my film photography, and that process is just as rewarding as the final result. I found myself caught up in a world to which I do not really belong over the past few days. It took writing this story to shake me out of it. I am glad it did. Part of my problem (if indeed it is a problem) with photography, my own and others, is that I never really look at it as a stand alone art. Although I have taken a fair share of photographs that could be displayed on a wall, complete to themselves, they really don’t satisfy me. No, it’s the photographs that can be woven into a story that appeal to me. Be the story narrative, descriptive or indeed poetry. Photographs that illustrate, accent or counterpoint. That’s the real reason I find so much popular photography uninvolving. I cannot form a narrative around these images, or if I can, I find it to be trite and clichéd. It’s a shame in a way. I am always likely to feel that I operate on the margins of the broad mainstream of photographic endeavor even as part of me craves to embrace it. But that’s where I am. I’m not going to change. After all, roaming the edges of many aspects of life describes much of my personal history. I will never really be an insider.